So you’re thinking of applying to Cambridge, but you’ve heard the rumours: Cambridge students work all day to make the most of their short 8 week terms, leaving no time for relaxation and socialising. I can tell you straight away that this is not true. Of course, in order to maintain its reputation, Cambridge has high contact hours and encourages you to work hard outside of lectures. However, Veterinary Medicine is one of the most jam-packed courses you can do, and I have never felt like I’ve been missing out on the Uni experience. My average day probably consists of 3-4 hours of lectures and a 2 hour practical. In first year, I also had 3-5 one hour supervisions per week which were often slotted in around lunch time or in the evening. During these supervisions, you normally get set work to do in your own time, but hopefully your supervisors will communicate and you won’t get set 4 complex essays in one week! Sometimes you get short answer questions, calculations, or even get given a week off! Essays definitely took much longer at the start of the year when writing a Cambridge-worthy scientific essay was still new and unfamiliar. This is all the mandatory work that you have. This will of course vary depending on your course and the point in the term, and for humanities there will be fewer hours spent in lectures and more doing independent reading for essays. However, it is also strongly advised that you either pre-read lecture courses or read back through them afterwards and make extra notes. I didn’t do this so much in the first term, and regretted it! This might take an extra hour out of your day, but can be done in gaps between lectures. My typical ‘down time’ during a week would be allocated to one 2.5 hour orchestra rehearsal (followed by a bar trip), one 2 hour jazz band rehearsal, brunch and a shopping trip with friends on a Sunday, and maybe a formal or a clubbing trip. Of course, I also had free time for chilling and chatting with people from my college. Aside from London, Cambridge is one of the most popular cities in the country for tourists to visit, and it is easy to understand why. Especially during the summer months, King’s Parade is packed with pedestrians taking in the sights of King’s, Trinity and the Senate House. However, there is more to Cambridge than these world-renowned vistas, and sometime of the most memorable and magical spots are the ones that the majority of tourists don’t see. I have therefore compiled a list of places to explore in and around Cambridge which are often overlooked by the floods of tourists who visit, and make great escapes from the stress of Cambridge life, especially for the students who call it their home. Technically this is not a single place, but if you are looking to take some great photos of Cambridge, then it is best to either get up early or wait until sunset. At 7.15am, King’s Parade is almost entirely deserted except for the occasional runner or photographer. Although you won’t be able to visit colleges at this time, it is a great time to get a feel for beauty of the city and feel like you have it to yourself. Hidden behind Peterhouse college, most Cambridge students (except for badminton or croquet players) do not know that this exists. You have to walk through all of the courts right to the back of the college, and you come out into a surprisingly large and secluded area of interconnected green spaces next to the river. There are lots of benches, and this is a great place to go if you are a student wanting to do some reading but wanting to get out of the library. Another great way to get away from the pressure of Cambridge life is to go for a short cycle ride along the banks of the Cam, starting from Jesus Green. If you keep going for a few miles and navigate your way through Milton, you will come to Milton Country Park. Yet again, this is virtually undiscovered by tourists. A multitude of cycle paths wind their way around man-made lakes, and there is a tourist centre and café. A great place to go on a hot summer’s day. Before selecting Veterinary Medicine as your degree choice on UCAS, it is wise to know what you are signing yourself up for, especially if Cambridge happens to be one of your University choices. It is clichéd but true that you are not choosing a degree but a way of life. The degree itself is 5 years long at most Universities, but 6 at Cambridge due to the fact that you receive 2 degrees (the equivalent of a Natural Science degree after 3) not 1. The stereotype of the course at Cambridge is probably of long hours in the library with little animal contact, but is this true? During first year at Cambridge, you have lectures in 3 main courses and 2 other smaller ones. Because it is Cambridge, all of these courses have unnecessarily complex names which are often shortened, meaning people on other courses will often be very confused when listening to vet conversations. The 3 main courses are Homeostasis (or HOM, which is essentially physiology), Molecules in Medical Science (MIMS, which is biochemistry) and Veterinary Anatomy and Physiology (VAP, which does what it says on the tin). The two smaller courses, whose exams are pass/fail and are sat at the end of the second term, are Introduction to the Scientific Basis of Medicine (ISBM, essentially stats) and Principles of Animal Management (PAM). For HOM, MIMS and ISBM, vets share lectures with the Medics. Cambridge is certainly unique amongst vet schools in the heavily scientific nature of its course. At times it can be difficult to see how what you are learning is relevant to the veterinary medicine degree, but that would be taking too literal of an approach. The course is teaching you logic, problem solving and the foundations of the mechanisms by which the diseases and drugs which will be learnt about later work. Contrary to popular folklore, vets at Cambridge do not spend their whole day in the lecture theatre. As part of the PAM course, one afternoon per week in the first term is spent doing animal handling of species varying from budgies to horses. There are then animal handling exams at the start of the next term. In addition to work with live animals, the VAP lectures are complimented with biweekly dissections of a dog that you are assigned at the start of the year in a group of 4. Throughout the year you get to dissect a variety of specimens and species, including a whole horse. However, the popular opinion of the work load of the course at Cambridge is more accurate, and you certainly have to be prepared the work hard during weekends and holidays. The number of contact hours is high, and in order to keep on top of the material it is also helpful to either pre-read or make notes afterwards. In addition, you are set an average of 2 essays per week for supervisions. However, there is a lot of time between the final lecture of the year and exams for revision, and with sensible time management it is possible to have a great social life, take part in clubs and societies, and to give yourself some crucial down-time. It’s that time of year again: A level results day. But what can newly confirmed Cambridge Freshers expect from their first week at University? At Cambridge, the period before lectures is actually five days, not a week. Here are some of the things you can expect to have done by the time you walk into the lecture hall of the first time on Thursday morning. The tradition of college families is very important at Cambridge. Essentially, during your first year you find a friend of the opposite gender to ‘marry’, and are then assigned college children (often doing similar subjects to you) to look after during their first week and beyond. Some people may have even met and married their own college spouse within Freshers’ week, although marriages like these often don’t end well! My college parents were brilliant at helping me settle in, and gave me a tour, took me to the pub and cooked a family meal during the first week. Obviously this is entirely voluntary, and for many Cambridge students Freshers’ week may be the only time they venture any where near a club during the whole year. I would definitely recommend making the effort to go out at the start of the year and socialise as much as you possibly can, although maybe try to avoid ending up on antibiotics to cure your Freshers’ week induced ailments! I cemented many friendships with my closest Uni friends on nights out in my first few weeks before work really kicked in, and with the aide of that well known social lubricant, alcohol. ‘Matriculation’ sounds like some strange ceremony performed at Hogwarts, but it is essentially just officially enrolling as a member of your college. This will probably be the first time you get to wear a gown, an essential piece of Cambridge kit which keeps the Hogwarts comparisons flowing. There is also a lot of photo taking, and a meal that is fancy even by Cambridge standards with copious free wine, leaving you with the social dilemma of whether it is OK to be drunk whilst sitting next to your Director of Studies. This takes place on Parker’s Piece, a large green space in the middle of Cambridge. The number of societies on offer is overwhelming, especially as the fair is split between an outside marquee and an inside venue across the road. I would definitely recommend doing some research before you arrive so you aren’t overwhelmed and don’t end up signing up for ten societies that you are never likely to go to. Before you leave, don’t forget to grab your free Dominoes pizza, and you can always come back for more as the fair happens over several days! Use Freshers’ week to buy yourself a bike if you don’t already have one! Try and get out of your room as much as possible and meet lots of different people. I made friends in the most unlikely of situations. However, don’t wear yourself out too much for the start of lectures! A year at Cambridge consists of three terms, and each are only eight weeks long. This is significantly shorter than at many other universities, which may seem counterintuitive, but the word ‘holiday’ is a misleading term, and you are expected to spend a significant amount of time out of term time working. I wanted to try and give a brief snapshot of a year in Cambridge in one blog post, so have created a list of the best and worst parts of my university experience. Everyone has moments when they start to question their life decisions and hate their course, but these have been few and far between this year. 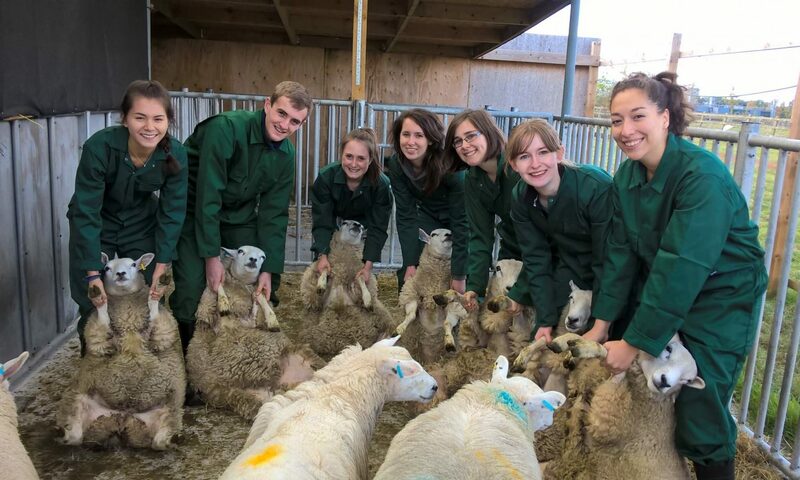 The first year of Veterinary Medicine at Cambridge is so diverse: my first term contained weekly animal handling sessions, dissections (ranging from dogs to horses), biochemistry and physiology practicals, and of course weekly lectures for our five sub-courses. This one doesn’t really need much explanation. I still haven’t got used to walking past tourist attractions that people travel from across the world to see on my way to lectures. If you ever feel the need to escape the atmosphere of the city, the nearest green space will be a maximum of a ten minute jog away. ‘Social life’ and ‘Cambridge’ may not be naturally associated in the minds of many. It’s true that Cambridge may not have the biggest clubs, but that doesn’t make nights out any less enjoyable. The collegiate set up is great, because it means you get to know most, if not all, of the people in your college, who will be studying a wide variety of subjects. You will also make friends with people on your course, and with members of any societies that you choose to join, meaning it is almost impossible not to find a group of people that you gel with. The fear of missing out, or ‘FOMO’, is an experience common to every fresher, but is especially bad in the Cambridge bubble. Terms at Cambridge are short, being only 8 weeks long, and in those few weeks you have to fit in lectures, supervisions, individual work and choose between the plethora of other activities that are on offer in a place full of super-talented people. There will be evening when you have to chose between doing you work due in for 9AM the next morning, sleeping, clubbing with friends, or a society that you signed up for in the haze of Freshers’ week, and whichever you choose, you will inevitably feel like you have made the wrong choice, and are therefore missing out. Many courses have very few, if any, lectures in exam term. This makes the lead up to exams a very different experience from the first two terms. You have to manage your own time, and this often involves long hours spent either in your room or in a library making notes or reading textbooks. Whichever window you look in, there are people working, and most people reach a point where they feel guilty whenever they take a break, as they know that their neighbour will almost certainly be working. In some ways, this is a more intense and inescapable version of FOMO. At some point in their first year, everyone will have a bad supervision. Supervisions are basically Cambridge’s equivalent of lessons, where groups of students ranging in size from one to eight meet weekly with a supervisors to check their understanding of what they are learning, and to be set work. Tales of woe can be as dramatic as students sleeping through supervisions (or falling asleep within them), or can be as mundane, but still just as distressing, as being given a 3rd in an essay they spent days working on, or simply being unable to answer any of the questions thrown at them. Feel free to leave me any questions in the comments. I have just finished my first year studying Veterinary Medicine at the University of Cambridge. Studying there had been my dream since a very early age and although this year has been the most challenging year of my life, it has also been the most enjoyable and rewarding. I wanted to create a blog to share my experience so far, both of studying Veterinary Medicine as a subject, and of Cambridge in general. I will be posting on a wide range of topics, such as interviews and Freshers’ week, and in the process will hopefully dispel some of the myths and mystique which surround Cambridge. If anyone has any questions relating to any of these topics (or University more generally), or suggestions for blog posts that they would find helpful, please feel free to leave me a comment!